We now have internet back up at the Construction Services East office. Hurricane shutters are being removed this afternoon. The skeleton accounting staff is enroute to the office. Other staff members able to work this afternoon are encouraged to do so. All operations return to full staffing on Monday. Subcontractor check distribution will occur today (as normal) from 2 to 5 pm. Almost all jobsites have reported in, with no damage losses. For Construction Services West operation, no builder sites were impacted by yesterday or this morning’s weather around SW Florida. It is “business as usual”. For Construction Services East operation, assessment of the builder sites is well underway, and thus far no damage losses have been reported. Further details will follow once the assessment is complete.The office did not sustain any damage, and has electricity — but no internet. The internet outage is currently being worked on. A skeleton staff is currently “on call” with the hopes of distributing subcontractor checks this afternoon if indeed that can be arranged for. Additional information will follow shortly. 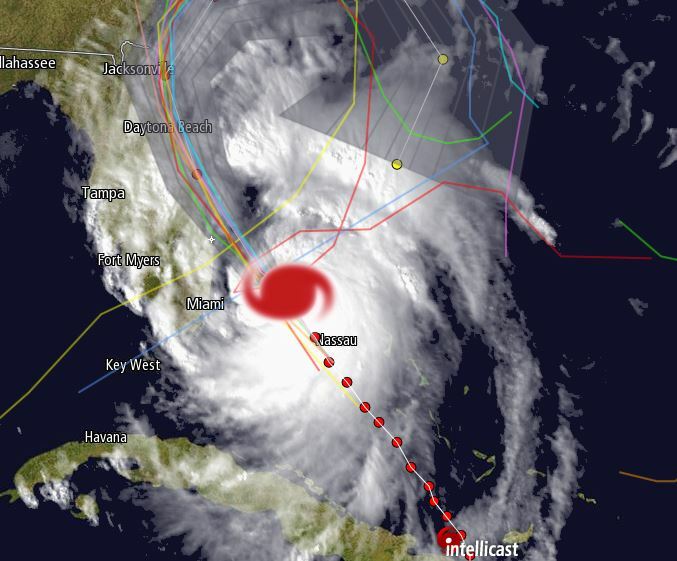 With Hurricane Matthew now departing SE FL, Construction Services East operation will begin this morning assessing both our own office’s operating condition, and the condition of all of our builder client’s jobsites. Our builders will be made aware that we were there, and what we have identified. Further updates throughout the day today will apprise you of the situation. Construction Services West is also performing the same condition assessment of all of their builder jobsites. while a gust of 45 mph (73 km/h) was reported at Orlando, Florida. The current eye of the storm is due east of Miami, and significantly offshore of the coast. This will bode well for us, assuming the track continues due north (as opposed to northwest). Update from Ray Morffi (branch manager at USI Professional Boynton Beach) who is on the ground in Broward County: “So far so good and it looks like it will stay to the east of Dade and Broward…so far we’ve had very little rain or wind…based on my conversation with Alan who lives in Palm Beach – basically the same. With the timing, duration and strength of the storm in mind, the East office of Construction Services will be closed Friday (to insure all are not at risk traveling too soon following the passing of the storm). The status of the office will be confirmed Friday late afternoon, regarding the building itself, access and power supply. Subcontractor check distribution will not occur Friday. Saturday check distribution will be arranged for. The exact timing and location for that will be decided following confirming of the East office status on Friday afternoon. 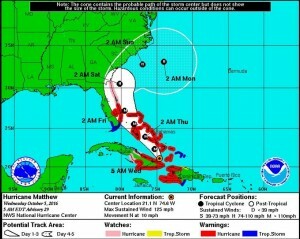 Matthew, currently a Cat 3 storm and building towards becoming a Cat 4, has hit the Bahamas and is now approaching Florida. There are a variety of mandatory evacuations on Florida’s East Coast due to the predictions of storm surge. The 5:00 a.m. advisory calls for a landfall for Matthew somewhere near Cape Canaveral around midnight tonight. For SE FL, this morning into early afternoon will be the final opportunity for preparations before the onset of storm conditions. Tropical storm conditions begin later this afternoon and will worsen throughout the evening. The strongest winds will be felt in the overnights hours in the area between the Palm Beaches and Cape Canaveral. If you live directly in the predicted strike zone, please give serious thought to seeking shelter as far away from the storm path as possible. Construction Services West FL operation will be open normal hours today. The 11:00 am advisory now indicates that winds will reach tropical storm force in SE FL in the afternoon tomorrow, and peak wind speeds should start to be felt around 11 pm then continue on into the early morning hours on Friday. The Construction Services East Office will be closed as of lunchtime today, and will remain closed until Friday midday (if the current forecast holds true). Office preparations are underway and will be completed today. Despite the East Office closing today , this week’s subcontractor check run will still be processed tomorrow from the West Coast office. East coast subs will be able to pick up checks Friday from 3pm to 5pm provided Boynton office can be re-opened. Subcontractors authorized to pick up checks can call our main line (561-330-7155) to find out if someone is on-site distributing checks. If the phone is not answered on Friday, that means the office is not opened. They can also read this blog, which will be update at the situation unfolds. If we are unable to open the office Friday 3pm to 5pm, the office will be open Saturday from 10am to noon for anyone wanting to pick up checks. We will be open either Friday or Saturday but not both. Subs on ACH will get their ACH deposited Friday as normal. If a subcontractor is interested in signing up for ACH that isn’t on it already, we strongly encourage they contact Ines Freire next week to get set-up. Situations like this help prove the value of being on ACH. Construction Services West FL operation anticipates no interruptions in our service and will be conducting “business as usual” regarding office operations. Field preparation for tropical storm conditions have been completed per our guidelines and those of our homebuilder clients. After the storm passes, each manager should contact their employees to ensure they are safe and OK. Please contact your Branch Manager to report any issues or the “all clear.” Branch Managers should report up to their respective RVP. If there is an issue or you need assistance, please contact Corporate HR at 651-225-6300 or Kristin Nordling at 651-225-6319. ← What are the code requirements for various IECC climate zones?